Tuesday, July 19, 2016 – HaysMed was recently reaccredited as a Chest Pain Center with Primary Percutaneous Coronary Intervention (PCI) by the Society of Cardiovascular Patient Care. Hospitals that are accredited by the Society of Cardiovascular Patient Care have achieved a higher level of expertise caring for patients who come in with a complaint of chest pain or are experiencing symptoms of a heart attack. More than five million Americans visit hospitals each year with chest pain. Heart attacks are the leading cause of death in the United States, with 600,000 people each year dying of heart disease. Coordinating care to reduce treatment time is critical, especially during the early stages of a heart attack, which often includes chest pain. 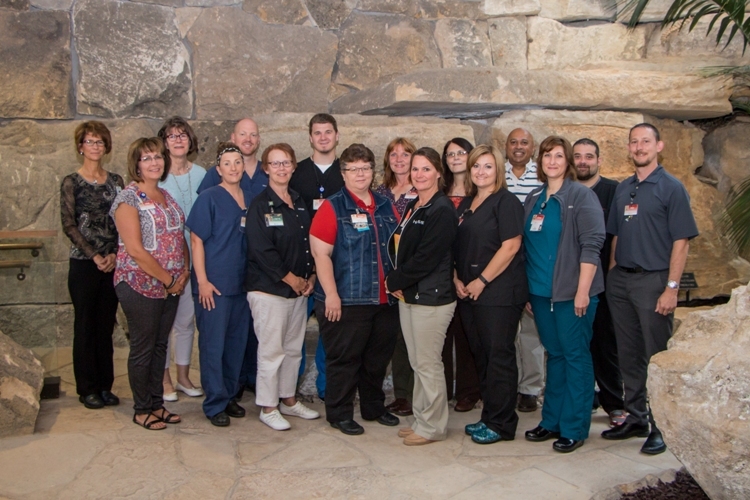 “I am very proud of my accomplishment and our teams’s commitment and dedication to providing exceptional heart care,” said Carol Groen, RN, BSN,CEN, NE-BC, Six Sigma Green Belt Certified, Manager of Clinical Certification and Special Projects at HaysMed. Groen oversees the Chest Pain accreditation and is the driving force behind the committee’s success. Hospitals awarded the Chest Pain Center with Primary PCI designation have dedicated resources to help all types of chest pain patients. These resources include a call team made up of Cardiac Cath Lab staff and an Interventional Cardiologist available 24/7, every day of the year. This team arrives at the hospital within 20 minutes of activation for a suspected heart attack emergency. All team members use an evidence-based, protocol-driven approach to maximize efficiency, which leads to quicker treatment time and improved outcomes. “I have been able to bring together diverse medical entities such as EMS, the emergency department and cardiology to assess, diagnose and treat patients who come to us with symptoms of a heart attack. This teamwork between the departments helps ensure all chest pain patients receive appropriate protocol-driven and timely care,” Said Groen. The goal of the formal accreditation is to significantly reduce the mortality rate for chest pain patients. “It’s important for everyone to recognize the early symptoms of a heart attack. Knowing the symptoms and calling 911 is critical to survival.” Groen further emphasized. HaysMed was first accredited as a Chest Pain Center in 2013.